Automatic security alerts are generated by configuration changes to other Check Point Network Security Software Blades, which negatively impact the overall security status. Alerts highlight potential security and compliance violations, reducing the time required and errors associated with manual compliance management. Compliance alerts notify users of the impact of their security decisions and brings regulatory considerations into the forefront of security management. 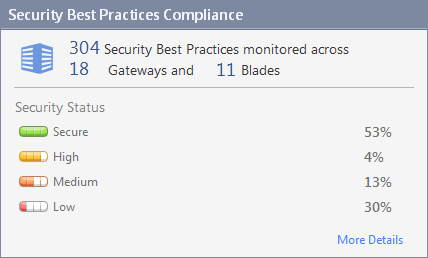 The Compliance Software Blade is fully integrated into the Check Point Software Blade Architecture. It is the only compliance product that can be automatically and natively implemented with Check Point. 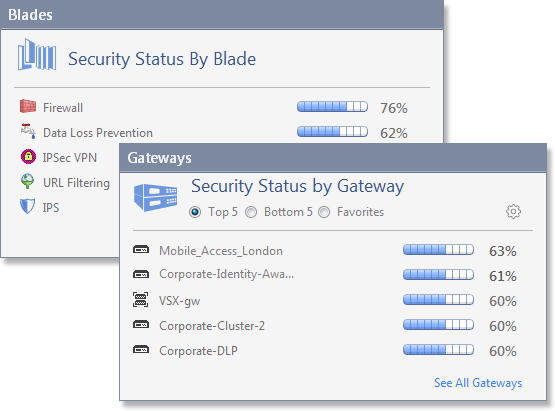 The Compliance Software Blade can be easily activated on existing Check Point Security Gateways and Management Servers, saving time and reducing costs by leveraging existing security infrastructure. 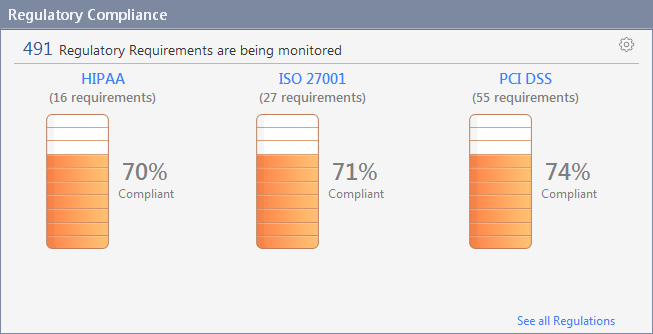 The Compliance Software Blade provides a clear overview of security compliance position and enables the monitoring of multiple regulations in a single view. Regulations are broken down into the individual requirements and mapped to Check Point’s library of security best practices. As a result, each regulatory requirement is translated into a set of security configuration settings, allowing network security managers to focus on security while improving compliance and providing detailed audit-ready compliance reports with a simple click. All security best practices have corresponding recommendations, assisting security managers in understanding what actions need to be taken to improve compliance and security. The Compliance Software Blade enables effective management of actions and recommendations, and facilitates the prioritization and scheduling of action items. 2 HIPAA Patient data protection act for healthcare in the U.S.A.
17 APP The Australian Privacy Principles (APPs) replace the National Privacy Principles and Information Privacy Principles and apply to organisations, and Australian, ACT and Norfolk Island Government agencies. The APPs reference here are taken from Schedule 1 of the Privacy Amendment (Enhancing Privacy Protection) Act 2012, which amends the Privacy Act 1988. 18 CJIS CJIS is the Criminal Justice Information Services Security Policy. The essential premise of the CJIS Security Policy is to provide appropriate controls to protect the full lifecycle of CJI, whether at rest or in transit. CJIS is divided into 12 individual policy areas. The controls listed here are referenced in Version 5.2, dated 08/09/2013. 19 Katakri Katakri 3.0 refers to the Finnish National Security Authority's National Security Auditing Criteria. Katakri is divided into four sub-divisions: Administrative, Personnel, Physical, and Information Assurance. The mapping provided by Check Point has focused on Information Assurance. Katakri provides different levels of security requirements. The Check Point Katakri mapping is based on 'Requirements for the base level (IV)'. 20 PPG234 This prudential practice guide (PPG) aims to assist regulated institutions in the management of security risk in information and information technology (IT). It is designed to provide guidance to senior management, risk management and IT security specialists (management and operational). 21 POPI The Protection of Personal Information Act, 2013, is an official act of the Republic of South African parliament. This report refers specifically to Chapter 3 (Conditions for Lawful Processing of Personal Information), and more specifically Condition 7.19, Security Safeguards - Security measures on integrity and confidentiality of personal information. 22 Statement of Controls This report identifies the core control requirements of the Check Point Security Management, Security Gateways and Software Blades. All relevant security best practices have been mapped in line with Check Point recommendations. This report allows Check Point users to verify the status of their Check Point security environment and to ensure that it is in line with Check Point's recommendations. 23 CIPA The Children's Internet Protection Act (CIPA) place restrictions on the use of funding that is available through the Library Services and Technology Act, Title III of the Elementary and Secondary Education Act, and on the Universal Service discount program known as the E-rate (Public Law 106-554). These restrictions take the form of requirements for Internet safety policies and technology which blocks or filters certain material from being accessed through the Internet. 24 N-CIPA The Neighborhood Children's Internet Protection Act (NCIPA) place restrictions on the use of funding that is available through the Library Services and Technology Act, Title III of the Elementary and Secondary Education Act, and on the Universal Service discount program known as the E-rate (Public Law 106-554). These restrictions take the form of requirements for Internet safety policies and technology which blocks or filters certain material from being accessed through the Internet.